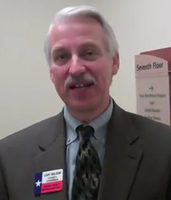 At the December 3rd State Republican Executive Committee quarterly meeting, Chairman of the Republican Party of Bexar County Curt Nelson went on video to update the TexasGOPVote community on what is going on in Bexar County and to discuss the upcoming Republican National Committee election. Full Transcript: Hi, I'm Curt Nelson. I'm the County Chair for the Republican Party in Bexar County, and I'm also a candidate for the Republican National Committee to serve as the RNC Committeeman for the State of Texas. A lot of exciting things happening in Bexar County on the Republican front. We have continued to see growth in the party, both in number of new people that are getting involved and engaged, and we're working hard on candidate recruitment as well so that we can have a full slate of strong candidates in the 2012 election, and we're trying to train candidates and identify candidates for future elections as well. As far as the Republican National Committee, I'm looking forward to the election, which will take place at the state convention in June in Fort Worth, and there are three people from the State of Texas that actually serve on the RNC, the state chairman of the party, there's a committeewoman, and then committeeman, and I'm running for that last position as a Republican Committeeman from Texas. The delegates at the state convention will make that choice. They'll elect the next committeeman, who will serve for four years on that national body.